This article is about the series. You may be looking for other uses of Kingdom Hearts. Kingdom Hearts (キングダムハーツ, Kingudamu Hātsu?) is a series of action role-playing games (RPG) developed and published by Square Enix. It is a collaboration between Square and Disney Interactive Studios under the direction of Tetsuya Nomura, a longtime Square character designer. Kingdom Hearts is a crossover of various Disney settings based in a universe made specifically for the series. It has an ensemble voice cast which includes many Disney official voice actors. Characters and elements from Square Enix's Final Fantasy series also appear. The series centers around the main character, Sora's, search for his friends and his encounters with Disney and Final Fantasy characters on their worlds. In Kingdom Hearts 3D: Dream Drop Distance, the series included characters and elements from non-Final Fantasy video game series produced by Square Enix as well, turning the series into a more general hybrid between elements from Disney and the entire Square Enix multiverse. In Kingdom Hearts III, Pixar was added. The series consists of various games across different video game platforms which was initially a point of contention for many players who could not afford all the platforms, although in the 2010s, most of the games were released in compilations on the PlayStation 3 and later, the PlayStation 4. The main bulk of the series can all be played on PlayStation 4, and those that can not such as Kingdom Hearts 358/2 Days and Kingdom Hearts coded were adapted into movies for these compilations. Some of the games were re-released as remakes or enhanced ports with the subtitle "Final Mix". There are currently 12 main installments released in the series (bolded in the "Games" section below, although note that the tenth is a movie). There have been several types of merchandise released along with the games, such as soundtracks, figurines, and companion books. In addition, the games have also been adapted into a manga series and novels. Most of the games in the series have been both critically acclaimed and commercially successful, though each installment has seen varying levels of success. As of December 2006, the Kingdom Hearts series has shipped over ten million copies worldwide, with 2.0 million copies in PAL regions, 3.0 million copies in Japan, and 5.6 million copies in North America. Tetsuya Nomura, the creator and director of the Kingdom Hearts series. Kingdom Hearts features a mixture of familiar Disney and Square Enix characters, nearly all of them coming from the Final Fantasy series, as well as several new characters designed and created by Tetsuya Nomura. Though the series features locations unique to the Kingdom Hearts franchise, worlds from Disney films are heavily explored. Sora must visit these worlds and interact with popular Disney characters to protect them from enemies. Often, Sora's actions in these worlds follow closely to the stories featured in their accompanying Disney films. However, in later games in the series, there is less focus on the Final Fantasy aspects and more focus on the Kingdom Hearts characters, instead making small nods and references to Final Fantasy. In one of the dialogues, Donald Duck tells Sora not to interfere with the worlds too much, since such interference would cause problems. Moogles, small creatures from the Final Fantasy series, are another common element in the games. They provide the player with synthesis shops in order to create items for use in the game. 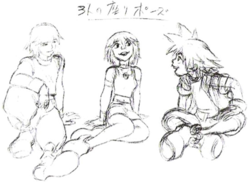 Early sketch of Riku, Sora, and Kairi. The Kingdom Hearts series is directed by Tetsuya Nomura, who also works as the character designer of the games. Nomura has stated that unlike working with Final Fantasy characters, keeping the main character Sora alive and interesting over multiple games is a challenge. He has also stated that though many of the Disney characters are not normally dark and serious, there were not many challenges making them so for the story, and despite this, their personalities shine because they maintain their own characteristics. 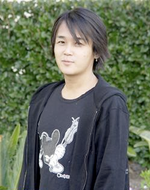 Though Disney gave Nomura freedom in the characters and worlds used for the games, he and his staff tried to stay within the established roles of characters and boundaries of the worlds. When deciding which worlds to include in the game, the development staff tried to take into account worlds with Disney characters that would be interesting. The inclusion of specific Final Fantasy characters was based on the opinions of fans and the development staff. Another criteria for inclusion was whether the staff felt the characters would fit into the storyline and in the Kingdom Hearts universe. Initially, Nomura was hesitant to use characters he did not design, because he was unfamiliar with the background work of such characters. For Kingdom Hearts II, he changed his mind after receiving pressure from his staff. Throughout the development of the games, Nomura has often left certain events and connections between characters unexplained until the release of future games. Nomura did this because he feels that games should have room for fans to speculate and use their imagination. He stated that with speculation, even though a game gets old, people can still be happy with it. As of Kingdom Hearts 3D: Dream Drop Distance, Tetsuya Nomura has begun to introduce characters from Square Enix's other produced game series, specifically The World Ends With You. Once protagonists have obtained the Keyblade, they are able to fight using various spells inspired by the Final Fantasy series, such as "Firaga". The Kingdom Hearts series contains both 3rd-person fighting and role-playing game elements. The games are driven by a linear progression to the next story event, usually told in the form of a cutscene, though there are numerous side quests available that provide bonus benefits to the characters. Furthermore, there are allies to aid the main character, Sora. The allies in play rely fully on A.I. controls, though players could later modify and customize their ability usage frequency. The combat system takes on real-time, meaning Sora could engage the enemy directly; various actions, such as attack and magic, are executable, during or after the battle. In Kingdom Hearts Chain of Memories and Kingdom Hearts Re:Chain of Memories the combat system was altered as Sora is no longer aided by his friends, and all of his combat commands are only executable via cards, with special attacks being executed with sleights. Additionally, combat no longer takes place in the same space as exploration; rather, whenever Sora engages an enemy, he is taken to a confined field for combat. The Gummi Ship is another common theme in the series, where it serves as a means of transportation for Sora and company to travel towards other worlds. Players can modify and customize these ships via blueprints and selected parts. In the release of Kingdom Hearts Final Mix, the first game contained Gummi Ship side quests. However, due to the criticism regarding the complexity of the Gummi Ship customization, the third game's Gummi Ship was toned down, providing easier and wider modifications, allowing players to customize it into either a small classed battle ship, or a grand carrier. Another recurring element of the Kingdom Hearts series is Jiminy's Journal, which functions as a bestiary and provides hints and simple character information. The journal also records Sora's minigame results, as well as unfinished side quests, allowing players to have easier resolutions to track the game. In Kingdom Hearts II, the battle system introduced a new gameplay element: Drive Forms, which allow Sora to gain access to new abilities via his combat garment, and wielding two Keyblades for a limited time (however, not every form possess this ability). Magic is simpler to execute, and Sora's MP gauge will recharge automatically once it is used up. Another gameplay element introduced is the Reaction Command, various actions only executable in several specific situations. These actions vary from talking to a character to performing combat abilities in battle. Kingdom Hearts Birth by Sleep introduced several new features to the series, such as Deck Commands, which allow you to use several unique attacks as well as items and magic, and the Dimension Link, which gives you access to several deck commands otherwise unavailable to the player. There is also the Shot Lock, which allows you to attack a multitude of enemies with many attacks, and the Focus Gauge, which is what allows you to use the Shot Lock feature. It also introduces Command Styles where the player gains the use of a different and more powerful combo. By filling up the command gauge with either attacks or deck commands, the player will be able to execute a powerful finish command. Which command you use is different depending on if the player is using a D-link or a command style. The games are influenced by their parent franchise, Final Fantasy, and carry its gameplay elements over into their own action-based, hack-and-slash system. Like many traditional role-playing games, Kingdom Hearts features an experience point system which determines character development. As enemies are defeated, the player gains experience which culminate in a "level-up", where the characters grow stronger and gain access to new abilities. The amount of experience is shared with all party members and each character grows stronger as experience is gained. Another recurring feature is the World music; all worlds have at least one normal field song and most have at least one battle theme. Three Keyblade apprentices, Terra, Aqua, and Ventus, train under Eraqus to become Keyblade Masters. However, one day, a Keyblade Master, Master Xehanort, mysteriously disappears, and at the same time, a vicious species known as the Unversed begin spreading throughout the worlds. Terra is sent to defeat the Unversed and locate Master Xehanort. Ventus is goaded into following Terra by Master Xehanort's enigmatic apprentice, Vanitas, and Aqua is instructed by Master Eraqus to bring Ventus back home and keep an eye on Terra. Along the way, Terra slowly begins to lose control in the darkness inside his heart, but finds solace with Master Xehanort, who appears to understand him. Terra crosses paths with a young boy named Riku and chooses him as his successor. Ventus befriends fellow Keyblade apprentice, Mickey Mouse, and crosses paths several times with Vanitas and eventually learns that Vanitas is actually the embodiment of the darkness inside him, extracted by Master Xehanort as part of his plan to forge the legendary χ-blade, capable of unlocking Kingdom Hearts itself. Ventus confronts Master Eraqus about this, who attempts to destroy him to stop the χ-blade's creation, but falls at the hands of Terra and Master Xehanort, the latter whom reveals his true intentions afterward. Terra, Aqua and Ventus eventually battle both Master Xehanort and Vanitas in the Keyblade Graveyard, where they each meet their fates: Terra is possessed by Master Xehanort and transformed into the new Xehanort, but the new Xehanort is defeated by the Lingering Will, Terra's armor animated by his lost mind; Ventus is possessed by Vanitas, but he, Mickey and Aqua fight Vanitas together, Ventus mentally, and Aqua and Mickey physically, but though they manage to destroy Vanitas, the χ-blade and wipe the Unversed from existence, Ventus's heart is damaged and eventually makes contact with the heart of a young boy named Sora, merging with it; Aqua places Ventus's now-comatose body to rest inside Castle Oblivion, and while looking for Terra, finds Xehanort in the Radiant Garden, where he was sent following the χ-blade's destruction, and battles him in an attempt to rescue Terra. During the ensuing fight, Terra temporarily regains control of his body, but Master Xehanort quickly retakes control and attempts to force Terra's heart out of the body, but darkness spills forth and Xehanort starts to vanish. As Xehanort begins to sink into the Realm of Darkness, Aqua follows and sacrifices her armor and Keyblade to save Terra's body while she remains in the darkness. Xehanort, now with amnesia, is found by the sage king of Radiant Garden, Ansem the Wise, and taken in as his apprentice. Mickey passes his Mark of Mastery Exam under his master, Yen Sid, and is awarded the title of Keyblade Master. Inside Xehanort, Terra continues to counter Master Xehanort, vowing not to stop until he has foiled Master Xehanort and expelled him from his body. Ten years later, the story focus shifts to Sora, Riku, and their friend, Kairi. The first game shows how Sora is separated from his friends when their world, Destiny Islands, is invaded by creatures known as the Heartless. During the invasion, Sora obtains the Keyblade, as Ventus's heart is still within him. Soon after finding himself in Traverse Town, Sora meets Donald Duck and Goofy, two emissaries from Disney Castle searching for the "key" per instructions from Mickey, their King. The three band together and travel to different Disney-themed worlds, sealing the Keyholes to the hearts of the worlds to prevent more Heartless invasions. Along the way, they encounter a group of Disney villains, led by Maleficent, who is controlling the Heartless. Though they eventually defeat Maleficent, the three discover that Ansem, who has apparently succumbed to the darkness, is the true mastermind. Ansem's plan is to open the door to "Kingdom Hearts", a door which holds the hearts of all worlds, in the hopes of attaining eternal darkness. Sora, Donald, and Goofy defeat Ansem, and seal the door with the help of Riku and King Mickey on the other side of the door. After sealing the door to Kingdom Hearts, Sora, Donald, and Goofy begin searching for Riku and King Mickey, finding themselves heading towards a mysterious fortress called Castle Oblivion. Upon entering the fortress, they begin to lose their memories. The three encounter a group of dark hooded villains (Marluxia, Larxene, Axel, and Vexen), part of a mysterious Organization. In the castle, Sora learns his memories have been manipulated by a girl named Naminé who was being held captive by the Organization. Sora, Donald and Goofy fight their way through Castle Oblivion and eventually encounter and destroy Marluxia, the lord of the castle, thus freeing Naminé from his grip. To allow them to regain their memories, Naminé puts Sora, Donald, and Goofy to sleep for a year; in the process, they must lose the memories of their experience in Castle Oblivion. At the same time, Riku finds himself in the basement of the castle and begins traveling to the first floor with the aid of King Mickey. Riku fights both the Organization's members (Vexen, Lexaeus, and Zexion) and the darkness in his heart, particularly the remains of Ansem, learning to accept his dual nature between light and dark. Allying himself with the mysterious DiZ, Riku aids him in keeping Sora and Naminé until the former is awaken. However a snag in the plan over the year forces Riku to go after a young man named Roxas, the thirteenth member of the Organization to enable Sora's reawakening. Roxas, who had defected from the Organization earlier on after doubting their true motives and desiring to meet Sora in person, encounters Riku and defeats him easily at first, but Riku succumbs to the Darkness inside him and takes on the appearance of Ansem. With his newfound power, Riku subdues Roxas and takes him to DiZ, but the ordeal leaves him stuck in Ansem's form. With their plan successful, DiZ orders Riku to eliminate Naminé, but Riku refuses, and instead lets Naminé go with Axel, who turned on Marluxia and chose to aid Sora in Castle Oblivion and who was Roxas's best friend. Seven days after Riku's success, Sora, Donald, and Goofy awaken in Twilight Town, with no memory of their time at Castle Oblivion, and resume their search for Riku and King Mickey. They learn of the Nobodies and are re-familiarized with their leaders, Organization XIII (Xemnas, Xigbar, Xaldin, Saïx, Luxord, and Demyx). Afterwards, Maleficent is resurrected and joins with Pete, another Disney villain, to find a new base of operations before resuming her quest for power and revenge on Sora. Sora once again travels to many Disney-themed worlds and resolves the troubles caused by not just Maleficent and Pete, but also Organization XIII whose members refer to him as Roxas. Meanwhile, Kairi is kidnapped by the Organization. They meet King Mickey, who reveals that the "Ansem" Sora defeated was actually the Heartless of Xehanort, who, sometime after being found by Ansem, betrayed his master and stole his name, and since then, Ansem the Wise has been missing. Furthermore, they learn that Xemnas, the leader of the Organization, is the Nobody of Xehanort. The three arrive at the headquarters of Organization XIII, The World That Never Was, with their own artificial Kingdom Hearts looming overhead, crafted from all the Heartless Sora has defeated, with Sora defeating all the Organization members as he is finally reunited with Kairi and Riku, who reveals Roxas as Sora's Nobody (as well as Naminé as the Nobody of Kairi) that he captured by willingly assuming the form of Ansem so that Roxas could be defeated and absorbed back into Sora. While this occurs, Mickey finds DiZ, revealed to be a disguised Ansem the Wise, with a device to digitize some of Kingdom Hearts' power; as the others arrive, the system overload causes the machine to explode with Ansem consumed in the blast, apparently killing him, with Riku restored to his original state. At the top of the castle, Sora and his friends battle Xemnas, who uses the remnants of Kingdom Hearts to fight them. Refusing to accept defeat, Xemnas separates Sora and Riku from the others to fight them in a final battle that ends with his demise. Though trapped on the other side, Sora and Riku are able to return to their world, via the Door to Light, which was mysteriously triggered from Sora's heart. With the threat of the Heartless and Nobodies apparently over, Mickey, Donald and Goofy return to Disney Castle, where they stumble across a mysterious message written in Jiminy Cricket's Journal, "We must return to free them from their torment". Mickey digitizes the journal and creates a Sora made from Data to uncover the mystery. Following the journal's debugging, Mickey and Data-Sora find the source of the sentence: it was a message from Naminé, who integrated a data version of herself into the journal to inform Sora that he is the "Key that connects everything", and it is his duty to save those connected to his heart from their suffering, namely the real Naminé, Roxas, Xion (a replica of Roxas created by Xemnas as a fail safe in case Roxas or Sora proved useless to the Organization), and Axel, as well as Terra, Aqua and Ventus. Mickey sends Sora a bottled letter about this. Back in the Realm of Darkness, Aqua stumbles across Ansem, who survived the explosion of the Kingdom Hearts Encoder, which sent him there. Ansem, with few of his memories remaining, fills Aqua in about his experiences with Sora, which brings Aqua to tears of joy, knowing Sora will come and rescue her and her friends. On Destiny Islands, Sora makes the decision to venture out to find and rescue his predecessors from their fates. However, after successfully locating Aqua and Ventus's heart (thus leaving only Terra to be found), Mickey also receives the shocking news from Yen Sid that the destruction of Ansem and Xemnas has led to the return of Xehanort, and this will eventually bring back Master Xehanort. Seeing as Mickey alone is not enough to defeat what is not "a single one of [Xehanort]", Yen Sid orders Mickey to summon Sora and Riku to him to undertake a Mark of Mastery Exam to properly prepare them for their imminent clash with Master Xehanort. Sora and Riku answer Yen Sid's call and he explains to them the details concerning Master Xehanort's rise and fall into darkness. Though Sora initially believes himself to be capable of beating Master Xehanort without becoming a Master, Riku readily agrees, in order to prove himself worthy of wielding the Keyblade, which makes Sora accept as well. Yen Sid assigns them to enter the Sleeping Worlds, where they are to locate and awaken seven worlds which were revived following Ansem's defeat but remained submerged in sleep, and in the process unlock the Keyhole of Sleep. If they are successful, they will be deemed Keyblade Masters. But along the way, Sora and Riku become separated and each end up encountering a mysterious young man in a black coat with ties to Master Xehanort and accompanied by Ansem, Xemnas and Vanitas, whom they believed to have been defeated long ago. Ultimately, Sora's journey leads him to the World That Never Was instead of the Realm of Light, where he meets up with Xigbar and the young man himself, who reveals that he is actually Master Xehanort in his youth from the past, who was paid a visit via time travel by the disembodied Ansem, who sent him on a mission to travel to different periods of time to gather various incarnations of Xehanort to build the real Organization XIII. Sora fights his way to the castle, but is intercepted by Xemnas and ends up with his heart damaged, whereupon he falls into a coma and is taken to the castle by Young Xehanort. Riku tracks Sora to the World That Never Was and finds him in the castle, where he battles and manages to defeat Young Xehanort with help from Mickey. Following the fight, Master Xehanort is finally revived, and reveals his true intentions: following his failure to use the χ-blade to summon Kingdom Hearts by pitting a heart of pure light against a heart of pure darkness, he has learned an alternate way of creating the χ-blade, since years before, after the Keyblade War, the χ-blade was shattered into thirteen darknesses and seven lights, and if Master Xehanort creates an Organization out of thirteen incarnations of himself, he will be able to recreate the χ-blade and start another Keyblade War. As Master Xehanort moves in to turn Sora into the thirteenth and final vessel for the Organization, Lea, Donald and Goofy arrive to aid Riku and Mickey, and Master Xehanort is forced to retreat with Young Xehanort, Ansem, Xemnas, Xigbar, Saïx and his other six hooded vessels. Riku brings Sora's comatose body back to Yen Sid, where he dives into Sora's Dive to the Heart and collects the fragments of Sora's shattered heart, in the process battling a corrupted Sora himself and winning. Riku succeeds in waking Sora up, but Yen Sid only names Riku as a Keyblade Master for his efforts. Sora, undaunted by his failure, congratulates Riku and immediately after Lea shocks everybody present by summoning his own Keyblade, something he had only recently mastered and was unable to use against the Organization. After this, Sora departs again to train alone, not having been able to properly resist darkness. With the knowledge of Master Xehanort's plans, Yen Sid orders Riku to bring Kairi to him so that she may undergo training with her Keyblade and become their seventh light to counter Master Xehanort's Organization XIII. In order to thwart Master Xehanort's plans, Sora, Donald and Goofy embark on a quest to find Seven Guardians of Light and the "Key to Return Hearts", while Riku and Mickey search for previous Keyblade wielders. Despite instances of mild censorship breaks, the Kingdom Hearts series keeps a majority of its content "child-friendly". It refrains from using profanity and making sexual references, as well as from dressing its female characters in revealing outfits. While these elements are common in the Final Fantasy series, Kingdom Hearts prides itself on maintaining Disney's values. Death and suicide are also not treated realistically in the series, often with characters disappearing, dying off-screen, being revived later, etc. In Kingdom Hearts Chain of Memories, Axel uses the words "hell" and "damn". The main reason Kingdom Hearts II received an E10+ rating, however, was the appearance of blood and alcohol in Port Royal. Axel uses the word "damn" in conversation with Saïx in Kingdom Hearts 358/2 Days. In Kingdom Hearts Birth by Sleep, Maleficent uses the word "Hell" (albeit referring to the plane of afterlife), before facing Aqua and Prince Phillip in battle. "Hell" is used once again in Kingdom Hearts 3D: Dream Drop Distance by Sam Flynn, specifically when he argues with his father, Kevin Flynn, in one of the game's flashback sequences. For the most part, the series takes place in sequential order. The first game in the Kingdom Hearts timeline is Kingdom Hearts χ and intersects chronologically with the beginning of Kingdom Hearts χ Back Cover and the ending of Kingdom Hearts Union χ, followed by Kingdom Hearts Birth by Sleep and Kingdom Hearts 0.2 Birth by Sleep -A fragmentary passage-, which take place 100 years after Kingdom Hearts χ. The first Kingdom Hearts takes place 10 years after Kingdom Hearts Birth by Sleep and intersects chronologically with the ending of Kingdom Hearts 0.2 Birth by Sleep -A fragmentary passage-. The direct sequels to Kingdom Hearts are Kingdom Hearts Chain of Memories and Kingdom Hearts 358/2 Days. The sequel to Kingdom Hearts 358/2 Days is Kingdom Hearts II, which takes place one year after Kingdom Hearts and intersects chronologically with the ending of Kingdom Hearts 358/2 Days. Kingdom Hearts coded, which takes place shortly after Xemnas's defeat and King Mickey's return to Disney Castle at the end of Kingdom Hearts II, leads into Kingdom Hearts 3D: Dream Drop Distance, which sets the stage for Kingdom Hearts III and the conclusion of the "Dark Seeker Saga". It is primarily associated with Organization XIII and, by extension, Mushroom XIII, Finest Fantasy 13, and the thirteen floors of Castle Oblivion. The Director's Secret Report XIII is a thirteen-part exposé by Tetsuya Nomura. Riku's Session Limit includes an ability named "XIII Blades." There are thirteen letters in "Kingdom Hearts." Ars Arcanum consists of thirteen strikes if one includes the ability's follow-up attacks. In Kingdom Hearts Birth by Sleep, one can fight a grand total of thirteen matches at the Mirage Arena (this is no longer the case in Kingdom Hearts Birth by Sleep Final Mix). Thirteen Orichalcum+ are required to synthesize the Ultima Weapon in Kingdom Hearts II. The sum of all the letters in the names "Sora, Riku, Kairi" is thirteen. The same is true for "Roxas, Sora, Xion," as well as for "Roxas, Axel, Xion." There are thirteen letters in "Terra-Xehanort" and "Ventus-Vanitas." In the opening FMV of Kingdom Hearts, Kingdom Hearts Birth by Sleep, and Kingdom Hearts 3D: Dream Drop Distance, the letter "M" in the word "Kingdom" surges towards the screen distinctly; "M" is the thirteenth letter of the alphabet. The secret endings "Blank Points," "Signs of What's Next," and "Another Guardian of Light" end with the line "Reconnect. Kingdom Hearts." The letter "M" in the word "Kingdom" surges away from the screen when this line appears. There are thirteen letters in "End of the World," "Hollow Bastion," and "Radiant Garden." Put together, there are thirteen letters in "Light" and "Darkness." In Kingdom Hearts II, it takes thirteen hits to defeat Seifer for the first time. Donald's Centurion has a strength increase of thirteen. In Kingdom Hearts Re:coded, there are thirteen System Sectors, one of which contains thirteen floors. Sora is "Combatant thirteen" when he faces Rinzler in The Grid. Sora was also intended to be the thirteenth member of the true Organization XIII. In Kingdom Hearts 3D: Dream Drop Distance, there are thirteen Training Toy candies. In Kingdom Hearts Chain of Memories, to enter the last room in Castle Oblivion, one needs a card value of thirteen or more. Following the Keyblade War, the χ-blade was shattered into twenty pieces: thirteen of darkness, and seven of light. The sum of the time displayed on the clock present No Name (and by extension, Young Xehanort's Keyblade), 8:05, is equal to thirteen. Using the Restore Count reaction command during the battle against Marluxia's Absent Silhouette and Data Replica in Kingdom Hearts II Final Mix will restore the hit counter by thirteen points. In Kingdom Hearts, the Keyhole in Neverland is located at the thirteen minute point on Big Ben's clock face. The box art for Kingdom Hearts III features thirteen characters. It is mostly associated with the Seven Guardians of Light and the Princesses of Heart. Sora's Fenrir has the highest strength increase of all his Kingdom Hearts II Keyblades, at +7. Similarly, Winner's Proof has the highest magic increase, also at seven. There are seven magic spells Sora learns in the first game: Fire, Blizzard, Thunder, Cure, Aero, Gravity, and Stop. Vanitas is fought up to seven times throughout Birth by Sleep: once by Terra, three times by Ventus, and three times by Aqua, not counting the Vanitas Remnant. Roxas landed seven hits on DiZ's computer. Roxas spends seven days in the simulated Twilight Town. On September 20, 2018, to a tweet asking if Sora would be playable in Super Smash Bros Ultimate, series co-creator Shinji Hashimoto responded with "Yes!". It should be noted, however, that while Kingdom Hearts is developed by Square Enix, the series itself, including the characters, are owned by Disney. The November 1st Nintendo Direct revealed the full base roster, of which Sora is not a part of. ↑ Weekly Famitsu interview, Novermber 17, 2010: Tetsuya Nomura: "Kingdom Hearts 3D connects to Kingdom Hearts III; I plan on showing how they evolutionarily progress. [...] both the system and the story are tied to Kingdom Hearts III. It's likely that the ending of 3D will continue into the story of KH3." This page was last edited on 20 March 2019, at 19:59.